Listen to your father!” never carried more weight humanly speaking than when the Bible’s patriarchs dispensed blessing to their children. Their words were not just hopeful wishes for their offspring but personal and prophetic statements of divine decree. There is distinct significance in this case: instead of the norm and Esau the firstborn being blessed, Jacob is divinely designated as the recipient of the patriarchal blessing. Isaac feels he is dying and desires to dispense the important family blessing relative to continuance and posterity to his firstborn, Esau. Similar to a will yet far more reaching, the blessing extends to nature, and even how nations and others will be blessed by their treatment of the recipient. Esau never regarded the birthright’s importance. God said, “Thus did Esau despise his birthright” (Gen 25:34). Jacob, bargaining and later deceiving, at least desired the birthright. This desire demonstrated faith, and more. God had stated before their births that the blessing belonged to Jacob: “The elder shall serve the younger” (Gen 25:23). Also, in despising his birthright years before, Esau sold it to Jacob for a bowl of stew because he was hungry. It was not “taken” from him as he claimed (27:36). Esau wanted immediate self-gratification. He had no concern for the future, and little regard for his heritage or passing on blessing. As to his character, he is called a “profane person” (Heb 12:16). Regardless of Jacob’s deception, he did not “cheat” Esau out of the birthright. While Esau was on his hunting trip expecting to be blessed upon return, Rebekah and Jacob plotted deception. With the clock ticking, Jacob moved quickly, disguising himself as Esau and preparing a kid from the flock for a meal. The blessing included power, possessions, place, and posterity, and extended far beyond the immediate. The word “sons” (27:29), while appearing as if Jacob had more than one brother, rather widely encompasses the lines of both men as progenitors. It is significant that the divine name Elohim is used and not Jehovah when passing on this blessing. While the blessing is extensive, it is far more so when Jacob meets God in Bethel (28:13-15). Before Isaac, Jacob’s personal exercise and scheming to acquire the blessing is seen. But before God at Bethel, it is revelation from Jehovah as he comes empty, with nothing of self before the Lord, expressing awe and reverence. Far greater is the blessing from God when we do likewise! Isaac’s reference to “dew, fatness of the earth, and corn and wine” includes God’s power as Creator. 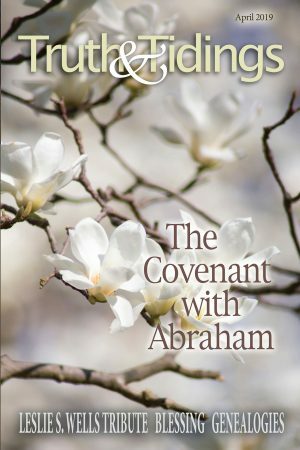 His blessing concludes with limited reference to the blessing given to Abraham. However, the mention of the tremendous proliferation of seed is absent. Esau returned successful from the hunt but lost the blessing. This is ironic considering he initially sold his birthright for a meal. Hebrews 12:17 tells us he sought repentance from Isaac. This is not repentance on Esau’s part but he sought a change of mind on Isaac’s part. No repentance was ever seen in Esau. However, God had overruled and His purpose was inviolate. Neither deception, self-will, our desires, nor Satan will change what God has stated in His Word. Jacob’s blessing was the purpose and will of God and he was the link to future blessing of the people of God. Yet Esau lost any link with the promised seed. What each received corresponded to their respective heart attitudes to the birthright and what it represented. Jacob was to receive fatness “from” (v28) heaven and earth, while Esau’s dwelling would literally be “away” (v39 ESV) from those same things. The same Hebrew word is used but carries both ideas, as the context determines the meaning (Gen 27:39). This is clear from the fact that the blessing cannot be identical, as well as Esau’s cry of lament (v34). There are touching contrasts to Jacob’s actions with those of our Lord Jesus Christ. While Jacob used deception to obtain the blessing, our Lord came as THE truth. While Jacob lied, presenting himself as another son, it was heard from heaven by the Father, “This is my beloved Son!” Jacob obtained an animal that died to procure the blessing without any real effort or cost. It cost our Lord all – to be the slain Lamb to provide blessing and salvation. Jacob’s hands were deceitfully wrapped in the skin of an animal. “The hands are the hands of Esau,” said Isaac. There is One who alone bears in His hands the marks that will forever tell the truth of Who He is! The smell Jacob acquired deceitfully from Esau’s clothes was the earthy smell of the field. Contrast our Lord: “All Thy garments smell of myrrh, and aloes, and cassia, out of the ivory palaces” (Psa 45:8 KJV). Isaac kissed Jacob in a sign of acceptance and recognition to bless. Judas kissed the Lord Jesus as a sign of his recognition and identification to betray. Our Lord Jesus stands alone, not desiring the blessing, for He “is over all, God blessed forever” (Rom 9:5), but as the Giver of the greatest blessings! The book of Genesis has foundational lessons which continue throughout the Word of God. One of the foremost is God’s sovereignty. What He says will come to pass. How wonderful this is for us as we depend on His faithfulness and word, and how important it is to live life based on the future. Our hope lies in the future and eternity. Clearly Jacob valued the future. A balancing truth is that Jacob valued his past and heritage. If we fail to embrace and value our heritage, we will have no future blessing. As assemblies of God’s people, we have a goodly heritage and we value the commitment and cost of previous generations. They too had to look to the past and future to pass along truth to us. If we do not value the past, we will lose the distinction of maintaining what has been handed down and passed on, and future blessing is in jeopardy on our watch. Most of all, it should be done with the great faithfulness of God in view. Jacob’s name was the last in the string of those beloved names as God revealed Himself to be “the God of Abraham, Isaac, and Jacob.” We may be the last generation to reveal Him in our day. May we, like Jacob, value the blessing and birthright handed down and rejoice in the faithfulness of our God to keep His word.